In the late ‘70s/early ‘80s, The B-52s turned disco on its head with sci-fi new wave numbers that were sure to get you twisting and twirling faster-than-the-speed-of-light. 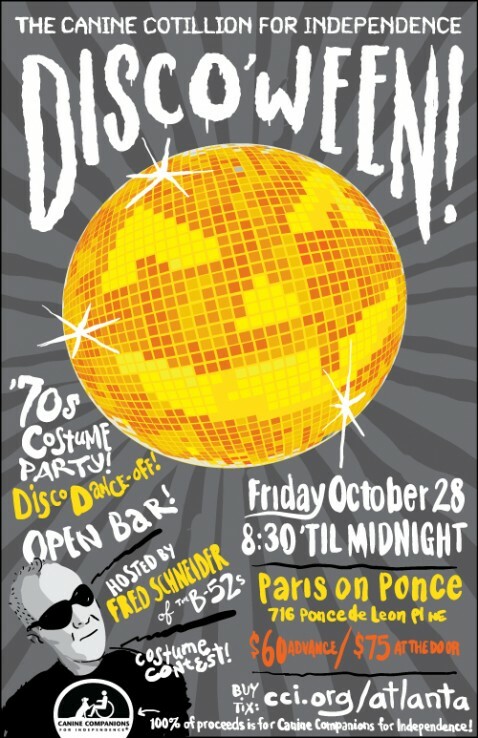 So it’s hard to imagine a more phenomenal host for Discoween, this Friday’s ‘70s inspired Halloween party at Paris on Ponce, than vocalist Fred Schneider. Indeed all the pre-buzz suggests an outrageous extravaganza worthy of the gregarious glitter-glam era, amplified by seasonal tricks and treats, including ‘70s dance hits spun by DJ Vickie Powell, Hustle dance lessons by Go-Go Ghoul Dancers, female impersonators selling ‘70s fashions, costume and dance contests for iPad prizes (OK, did you really want to win an old-school Atari? ), a photo booth to record your ‘70s awesomeness, Bad Taste but good tasting ‘70s snacks provided by Dennis Dean Catering, a raffle with period-authentic prizes including a vintage ‘70s Gucci purse and a framed photo of Elton John in the ‘70s taken by famed photographer Kate Simon, and much more. Best of all, you don’t have to feel any shame when partying like it’s 1979, because all proceeds go to Canine Companions for Independence, a global nonprofit that provides highly trained service dogs to people with disabilities. Discoween was conceived by Fred’s friend and lifelong animal lover Cathleen (Cathy) Smith-Bresciani, who recently founded the Violet Trust to sponsor training of CCI’s service dogs. Known for throwing fashionably fun charitable fetes, she also chaired the 2010 and 2011 official after-parties for Jeffrey Fashion Cares and Fred Schneider’s Spring Thang benefiting PALS and the Georgia Music Hall of Fame. Tickets (age 21 & up) are $60 in advance ($75 at door) and can be purchased at the Website for Dixie Dog Wear, Cathy’s online pet accessories boutique which donates 100% its profits to various charities. Designer Jason Wu, Cathleen Smith, Fred Schneider and Violet - a CCI service dog in training. Photo courtesy of Caren West PR. ATLRetro caught up with Fred for a fabulous pre-peek at Discoween, his personal love of ‘70s dance music, how he got involved and what’s up next for the B-52s and his sensational side project The Superions, which he playfully described to another blogger as “the most exciting group to hit the music scene since Elvis or Lady Gaga.” At ATLRetro, we have no doubt that’s true, Fred! ATLRetro: Why will Discoween be Atlanta’s best Retro-inspired Halloween party this year? Fred Schneider: Any party Cathy Smith throws is the best. Ask anyone. And DJ Vicki and I know how to get people shakin’!! What will you be doing as host of the party? Are you performing? Or Emceeing? Paris on Ponce is a very unique and cool venue. Do you shop there yourself (in which case what was your coolest Paris on Ponce purchase?) And how will that location play into the fun? Yes, I’ve shopped there. Got a great 1931 modern designer furniture book. The venue for the party already looks like something from TRUE BLOOD! What disco finest will you be pulling out of your closet, and any tips for putting together the ultimate outrageous ’70s disco costume? I’m shopping tomorrow for an outfit! Anything shiny spandex is a must. Especially if it’s unflattering! How did you get involved and why are you so passionate about Canine Companions for Independence? My good friend Cathy Smith named a dog and is sponsoring one. I also do a line of dog cookies for her Dixie Dogwear [called] Fred Schneider’s Dogstars. The B-52s were New Wave, which some people think of as anti-disco, but yet you were absolutely danceable. Did the band owe anything to the disco sound? I love new wave disco. There’s lots of disco music we all liked. What else are you and the B-52s up to now? Any recordings, other upcoming Atlanta appearances, eclectic hobbies, passionate causes? 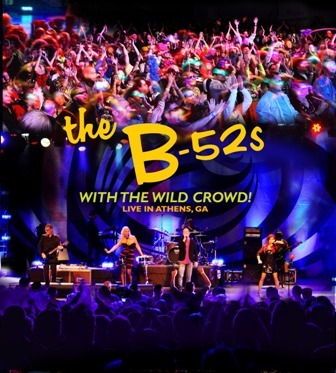 The B-52s have a new live CD, WITH THE WILD CROWD, we taped in Athens. A DVD will come out later. One dream would be to play our 35th anniversary show at the Fox next year. My side project, The Superions, have a single and mini-movie out now, BATBABY. Our Xmas CD, DESTINATION…CHRISTMAS comes out again to save the holidays!